A hiring manager looks to your resume as the main reference to learn more about you and your skills. The resume is what explains your background and abilities and how they fit the job at hand. If you fail to communicate clearly in this piece, it could put your chances of landing the job in jeopardy. To ensure you craft a winning resume that turns heads and impresses those reading it, you should always do your research before writing. The right style of resume should match what American employers want to see. Using American resume templates is a great start because they can serve as a guide to inspire you and assist you as you work. In addition, they help you to understand the correct formats and enable you to ensure you include all the pertinent information. Why Use American Resume Templates? Sticking to one page for your resume is usually preferred in most fields. If you are in a professional field or a field that requires an immense amount of experience or training, then you could go beyond one page. However, for most people, keeping your information concise and no longer than one page is ideal. Creative American resume templates are not for every field. Many hiring managers are not impressed by artistic resumes. However, if you are trying to land a job in a field where creativity is greatly valued, this is a style to consider. It goes outside of the normal boundaries and ideals of what a resume should look like, giving you the chance to present your information in a unique way. Popular American resume templates generally follow all the same formats. They become popular because they represent the style hiring managers prefer seeing. While this may seem boring to some, it is actually a benefit in many fields in which hiring managers look through piles of resumes and need to get through them quickly. If you try to get too creative with your format, it may hinder your chances of having your resume read. A chronological resume is a specific format where you list things in the order in which they occurred. Generally, a reverse chronological format is most popular because it would have you list your most recent experience and education first, which is likely to be more of an interest to hiring managers than what you did long ago. Traditional American resume templates are those that follow the general rules. This means it begins with an objective or professional statement, which is now more preferred. This is then followed by a skills list, your work history, and your education details. You should present the work and education sections in reverse chronological order. 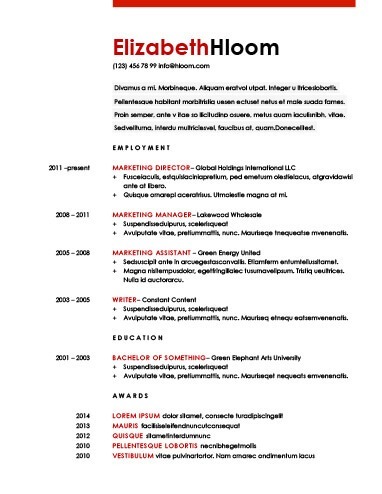 This is a resume style most familiar to hiring managers. If you really want to get a job, you really need to tell the hiring manager how to contact you. Forgetting to include your contact information is a fatal mistake. Make sure to put your name, address, email, and phone number at the top of your resume in a prominent position. To begin your resume, you need a statement that is strong, informative and engaging. The summary or objective statement tells a hiring manager the main information he or she needs to know about you. It encourages the hiring manager to keep reading and to learn more about you. You want to keep it succinct, but include enough information to explain who you are and what you can do for the employer. The skills section is usually presented in list form. It gives short snippets of information to draw attention to your most important and relevant skills. Include only the attributes that relate to the position for which you are applying. Make sure to be specific and avoid generalizations. Try to match the skills listed in the job description. This section is the meat of your resume. Include many details but also ensure conciseness. Using bullets is the best way to present your information to make it easy to read. Include a mix of job responsibilities and achievements or events of note that draw attention to your value as an employee. Again, try to keep everything in this section relevant to the position at hand and include some keywords found in the job description. The education section is not as important in some career fields as in others, but you should always include it. List the name of the institution, the degree received, and the year received. You may leave off the year if it was some time ago. You can also include information about courses taken if you didn’t receive a degree. In addition to using American resume templates, you may also consider using a resume builder. This type of tool walks you through the steps of putting together a stellar resume. It makes it simple to know what to include. Plus, it includes built-in formatting. You just answer some questions and it starts building your resume for you.